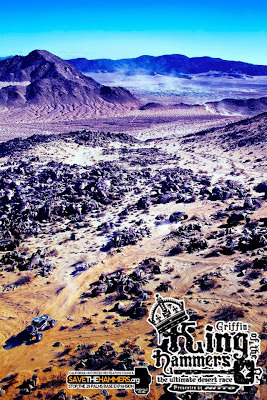 December 11th, 2013: JOHNSON VALLEY, CA: Hammerking Productions, the founders of The Griffin King of The Hammers Presented by Nitto Tire, are pleased to announce that the week-long off road festival held annually in Johnson Valley, CA will be able to continue in its current location for the foreseeable future. After six years of negotiations between the United States Marine Corps, the federal government and the Off Highway Vehicle(OHV) Community, a deal has been reached to preserve the majority of the land in Johnson Valley for OHV use. Congressman Paul Cook spearheaded the deal which allows nearly 100,000 acres of land to remain open to the public and managed by the Bureau of Land Management (BLM). The Marines will have access to approximately 55,000 acres of shared use land for 60 days a year to meet their training objectives, but will not retain ownership of the land the remaining 305 days a year. The proposed legislation is expected to pass the House later this week and the Senate next week before the holiday recess. The deal preserves access to the trail system known as “The Hammers.” Areas that were formerly at risk including trails named Spooners, Aftershock, Sunbonnet, and Riffle Canyon as well as the California 200 Memorial at the spot known as “The Rock Pile” on Bessemer Mine Rd. remain open to public recreation under the current plan. The plan also includes access to Soggy Lake, Emerson Lake and the majority of the Fry Mountains. ULTRA4 is a vehicle type, class and series. ULTRA4 Racing was born from the popularity of the annual Griffin King of the Hammers Presented by Nitto Tire, considered to be the toughest one-day off-road race. The vehicles are unlimited four-wheel drive, capable of competing in multiple racing disciplines – extreme rock crawling, high-speed desert racing and short course. In six years, the sport has grown significantly from the inaugural King of the Hammers to an eight race national series including a National Championship. ULTRA4 Racing is managed by Hammerking Productions located in Temecula, CA. To learn more, log on to www.ultra4racing.com.